AWESOME PHOTOGRAPHERS, CAN YOU GUESS THE ANSWER? HOW MANY TIMES SHOULD YOU FOLLOW UP A PHOTOGRAPHY ENQUIRY? Do you know the answer? Is it twice, three times, six times or not at all? Well quite simply, it’s until they book or tell you they have booked someone else. I know from a lot of research I’ve carried out over the past few years that 90% of photographers are not following up their enquiries and what’s worse is they are responding to the initial enquiry in completely the wrong way. The key to turning those enquiries into bookings is persistence. It’s not done by hounding the client into submission or reducing your price quote until they take the bait, it’s done by building up a relationship with them from that initial enquiry and showing interest in their need by keeping the conversation open using questions they will respond to. For example, most potential clients first ask you for a price quote telling you the date and venue for the wedding, commercial shoot or an event. The first stage to your reply before you even talk about yourself and your photography is to ask questions. If it’s a company check them out and compliment them on what they do and ask what type of clients they are trying to attract. If you are responding to her via Facebook Messenger or Text this is a great way to get the dialogue going and build a relationship with her in short, friendly, open messages. Remember people buy from people they like. Once you’ve asked a few questions of your potential client about their needs you then need to format your price quote. Again, don’t make this just a standard copy and pasted reply. You need to personalize it as much as you can, adding details about your service that will reflect to exactly what they are looking for. For weddings and portraits, you MUST reply with a very well written emotionally driven price quote. This is the real key to selling the benefits of your wedding photography and creating a real desire in her mind for your services, NOT trying to win her over with special offers or price reductions. I can’t overstate enough how important an emotionally driven price quote is to turn an enquiry into a booking and so many photographers don’t even bother. They just send a bog standard crappy impersonal reply the same as anyone else does. This is your time to shine and really stand out. Remember most brides are not going to book on price alone, especially if it’s a mid-priced to the premium wedding venue. She’s not looking at budgets she’s looking at what you can do for her. Likewise, with commercial clients, they aren’t looking for the cheapest photographer they are looking for a one that can offer a solution to their needs. A restaurant isn’t just looking for pretty images of their dishes, they are looking for amazing photographs that their clients can almost smell and taste in their Facebook News Feeds - they look that good. These photos will lead to bums on seats and money in the till, tell them that in your responses. Make sure that you end your price quote by thanking them again for their enquiry and tell them to drop you a message if they need any help or advice and that you are only too happy to help. Give it a few days then follow up with a friendly message to see if they had a chance to read through your price quote and if they have any questions or they’d like a more bespoke offer for their exact requirements. It’s often a good idea to offer a free top tips guide for commercial clients on how best to use images for social media or a guide to taking better photos at work from your I Phone. Go that extra mile, your competitors won’t be. Give them something for free and they’ll feel that you’ve given them value even before any services have been booked. When speaking to brides looking for wedding photographers try asking how the wedding planning is going and if there’s anything else you can do to help or if she has any questions. Quite often a bride will tell you that she’s just in the process of gathering quotes, which is fine you just need to be the photographer who is at the forefront of her mind. Keep building the relationship and keep the conversation open. I have a great little “Guide to Booking a Wedding Photographer” that I send to my bridal enquiries if they haven’t booked after the second follow-up message (I’d be happy to share this with you if you drop me a message). Remember don’t be pushy, be helpful, friendly and informative. The chances are your competitors have stopped contacting after the initial response. I once had a bride thank me for following up about 4 weeks after her initial enquiry, she’d just been in the process of moving house and it had slipped her mind that she needed to book her wedding photographer. Sometimes it’s just a good idea to remind a bride how important it is to secure their wedding date early on, especially if it’s a summer wedding. If you get another enquiry for the same date as hers then drop her a message offering her first refusal, this is often a good way to close the booking without putting the pressure on or sounding too salesy. As always if you have any comments please feel free to share them with me and let me know how you get on with formatting your emotionally driven replies and follow up responses. If you need any help drop me a message. Thanks for following guys and happy photographing, Jeff. 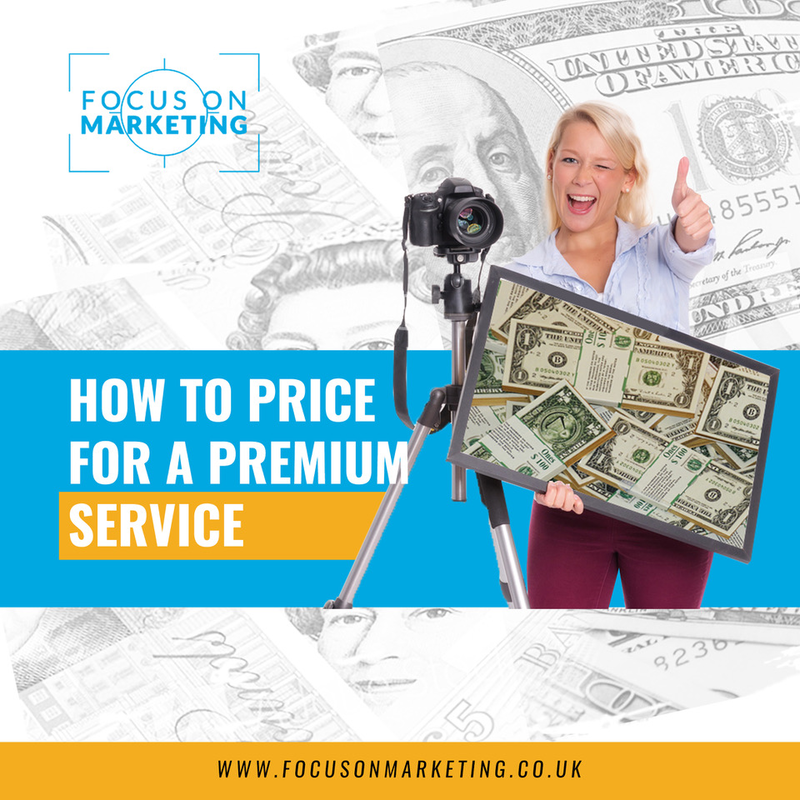 PHOTOGRAPHERS, TURN YOUR PRICE LIST ON ITS HEAD! When I first started out as a photographer I absolutely hated selling, it was my one biggest fear. I felt like I’d rather give my photos away than have to ask for money, crazy to think of that now. However, one of the biggest stumbling blocks I come across with photographers who sign up for my 6 Steps to Success Photography Marketing & Mentoring Program, is the sales aspect of the job that we all do. So, it’s basically LOVE Photography, HATE Selling and know bugger all about marketing. If this is you then don’t worry you are not alone and I was in the same position myself until I learned the secrets to upselling and using add-on’s to often double the value of my sales. One of the first things you need to do is create an amazingly expensive luxury package that you have no intention of ever selling but it creates a feeling of bespoke quality to your brand. Remember people buy photographs for emotional reasons or to solve a problem to a need, so create desire and emotional in your products and services and you will have this stage nailed. By starting with an amazingly expensive package this immediately creates a sense of quality and luxury to your brand. People associate good quality with higher prices, simple as that. So even your less expensive packages will be perceived as higher quality because of the image your amazingly expensive package has created in the client’s mind. This is why most car dealership have the “top of the range model” taking pride of place in the showroom. The salesman will knowingly show you the model that is way out of your price range, so you can feel the quality and enjoy all the additional gadgets. What he’s doing is creating a desire in your mind, knowing you can’t afford it. However the next model down may still be out of your original budget but includes a few of the beautiful features and gadgets you now desire from the top of the range model. Transfer that idea to your photography services, for example your top package comes with a gorgeous storybook album personally designed to their exact requirements, two smaller but equally as outstanding 8”x6” parent or grandparent albums, a beautiful and very personal pocket book album which fits perfectly into a jacket pocket or handbag, a stunning wall canvas print of your choice and, of course, all your images supplied on a deluxe USB Key complete with limited edition presentation box so you can print and share with family and friends. Wow amazing!! In reality we all know that you could just buy the USB Key and be done with it, then create the albums and canvas prints yourself. But once you create a desire for the albums and the canvas then each package down from your “Top of the Range” package just includes one item less for a further reduced price. The technique is to make the packages such that each package down from the Top of the Range is a little less value for money than the previous one, making the higher value option always the better deal for the client. I hope this gives you something to work on. Take my word for it once you get this right then the packages just sell themselves and you’ll always end up with a higher sale than the client originally intended because the higher packages represent much greater value for money. Also, its worth remembering it’s a lot easier to down sell than it is to upsell a client. Always start with your top package, if this is too expensive then they will have another 3 or 4 options to choose from. By starting higher this often sets the spending bar higher too, they will probably settle for the 2nd or 3rd package down and not your lowest priced, which would be easier for them to settle on if you start selling at the bottom. Once the main package is secured and decided on then it’s time to roll out your add-on’s. These are small additions that will compliment packages and are often offered at a discount but still produce a high profit for the photographer. Add-ons should be priced between £199 and £99 for maximum effect, always show the full price of the Add-on then next to it the Add-on Price if bought with any package.